To view Channel 8 TV News video footage of Harry & Marie's story aired on 25 & 26 Aug 2010 see A Soldier and the Dress Part 1 and A Soldier and the Dress Part 2. The article below is used with permission from http://www.mccoy.army.mil/ReadingRoom/Newspaper/RealMcCoy/current/Reunion.htm . A World War II veteran whose unit helped liberate a concentration camp and helped one of the survivors obtain a new dress was reunited with her more than 65 years later via the Internet June 13 at Fort McCoy. The reunion was done over Skype at the Fort McCoy Welcome Center. Fort McCoy personnel agreed to serve as the go between and offer the use of suitable computer equipment. 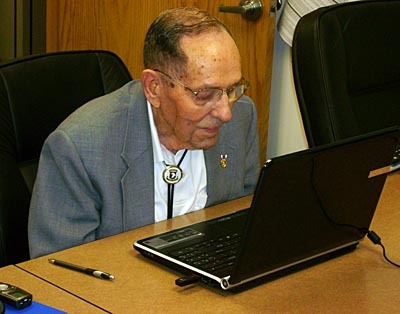 Harry Hendersin, 89, of Sparta was with the 506th, 101st Airborne Division in 1945, when unit members helped liberate the survivors at the Dachau, Germany concentration camp. Dachau is about a 20-minute train ride from Munich, Germany. Hendersin and the woman, Marie Lipstadt-Pinhas, who was then a young girl of 14, and now is nearing 80, never saw each other again after their war encounter. The memories came back to both during the reunion via Skype. The war was not over at that time, so Hendersin had to return to his unit and continue serving in the war, and he and Lipstadt-Pinhas had no contact since 1945. Lipstadt-Pinhas often speaks to school students in Belgium about her experiences in the concentration camp and mentions Hendersin’s kindness. “Harry is well-known in Belgium,” her daughter said. Lipstadt-Pinhas’ daughter said her mother never forgot Hendersin, and for many years, she attempted to find and thank him. Hendersin’s granddaughter, Kim Meyer, said his unit fought in Bastogne, Luxembourg, which was a part of the Battle of the Bulge, and he also parachuted with the 101st into Normandy on D-Day. Lt. Col. John Jacobi of the Fort McCoy U.S. Army Garrison said it was an emotional reunion between the two. The woman expressed great gratitude to Hendersin and to other Soldiers who helped liberate the camp. It made the Soldiers present appreciate what their services can mean to other people in addition to the nation they serve, Jacobi said.